Now that DCS: Persian Gulf is a complete map I thought it was time to revisit the paid map module. It’s been nearly a year of its initial release. How does the map stand up after a year of flying over it and is it worth buying? DCS: Persian Gulf started its public life under a different name: The Straight of Hormuz. It may have originally been the plan to build a much smaller map in scope but it matters little as the map that we now have is the largest in the DCS World series to-date. Far from being just another desert map, DCS: Persian Gulf features a lot of variety. Open ocean, expansive deserts, urban and industrial areas, fortress islands, and mountain ranges cover this map from one side the other offering plenty of diversity. There is over 200,000 sq. km inside the detailed map area and 29 airfields are represented with a variety of landing aids that can include TACAN, VASI lights, approach lights, and VOR. The map has its own unique weather effect with the ability to add sandstorm conditions that can blanket the area with variable layers of a reddish orange haze. The effect is both one that causes issues for visibility and it adds a lot to the mood of missions. The southern part of the map is dominated by major cities like Dubai and Abu Dhabi. These modern cities boast gleaming skyscrapers, beautiful hotels, resorts, beach areas, a monorail system, the artificially created islands known as The Palms, and a mix of urban, rural and industrial areas. Fly north across the straight to Iran and you reach the major port city of Bandar Abbas and the home port of the Iranian Navy. Back to the south for a moment where the map also features Al Dhafra Air Base. 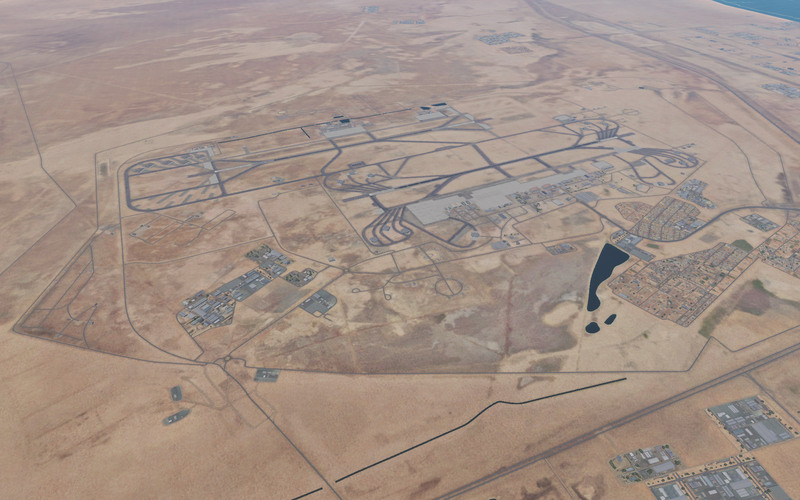 This sprawling airbase, in real life, houses F-16E/Fs and Mirage 2000-9s of the UAE’s Air Force as well as the USAF’s 380th Air Expeditionary Wing operating U-2S, KC-10, E-3 Sentry and multiple other types of combat aircraft on a rotation basis. Just this week, six USAF F-35A’s from Hill AFB were deployed to the base. The French Air Force has also operated out of this base over the last few years with Rafales and other types. This is all to say that Al Dhafra is very much a real-world location for military aviation and its just one of several on this map with the kind of history and present day relevance. Another relevant area of the map is The Straight of Hormuz which the map is loosely centered around. The strategic straight is the site of the transport of 20% of the world’s oil supply and is constantly a potential flashpoint ready to boil during periods of high tension. 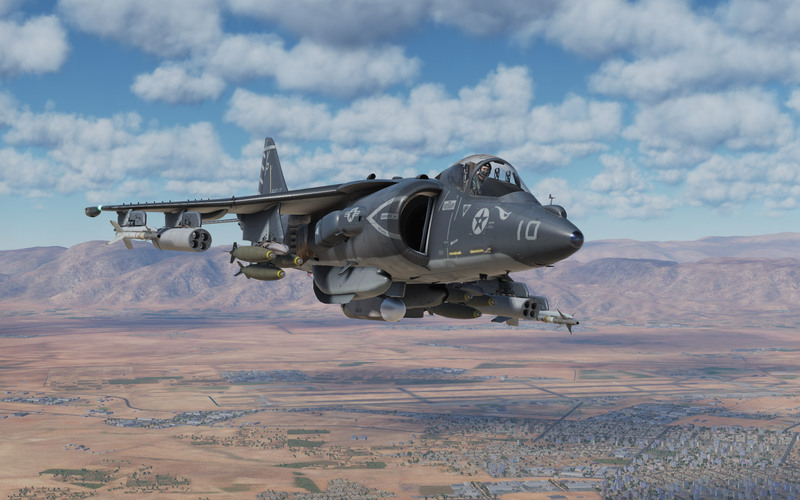 DCS: Persian Gulf taps into those potential headlines and offers plenty of opportunities for the modern air combat simulation featuring fictional battles over a realistic flashpoint. Satellite imagery at this altitude looks adequate. DCS: Persian Gulf is easily one of the best looking DCS World maps – at least, most of the time. In most areas the map features detailed terrain, SpeedTree shrubs, bushes and grasses, and it looks absolutely spectacular. Dubai is a notable area where the map is at its best. When you venture out to some of the other areas, however, it sometimes feels like the terrain resolution goes down a little and the effect is far less impressive. All cities and towns appear to have a lot of detail baked into each one. Eagle Dynamics’ artists made sure that building arrangements are realistic to their real world configurations. When I went hunting for some of the recently added ruins, I discovered that the Google Maps satellite view was largely what I was seeing from the cockpit of my jet in DCS right down to building placement. You expect that kind of attention to detail in places like Dubai but it also applies to smaller towns and villages. I’m very impressed by this. From a performance standpoint Persian Gulf works really well. I’ve flown on the map with two different GPUs and both 8GB and 16GB of RAM and my impression is that DCS: Persian Gulf runs as well as or better than the Caucasus map. Some users have reported frame rate drops in densely populated areas but even with a slower GPU and only 8GB of RAM I felt like these were acceptable drops. Fully loaded AV-8B near Shiraz, Iran. I’ve written my thoughts about the map above and in large part those haven’t changed since I first flew over the map nearly a year ago. Over that time, DCS: Persian Gulf has become my favourite map for DCS: World and it has done that for so many reasons from the aesthetic details to the overall usefulness of the map – at least for hypothetical scenarios. It’s also just fun to fly over and sight-see. Eagle Dynamics put a lot of effort into making sure that this map had all the necessary scenery, landmarks, and usable features possible before they released this map. That was a year ago. After that they went the extra mile and made the map bigger and better expanding to the north and adding almost twice as many airbases and airfields to take-off from. Granted, some of those additions are small scenery improvements like adding some notable hotels, resorts, the Formual 1 track, mosques, ancient ruins, and other key landmarks but they do add to the overall effect. All this effort costs time and money for the developers and to recoup those costs the map commands an expensive premium at $49 USD. By flight sim standards that’s not bad for 200,000 square kilometers but it does lock the map behind a paywall and a fairly pricey one at that. So, is DCS: Persian Gulf worth it? At $49 it is a tough sell but with a small sale discount applied I can say that it absolutely is worth it. The amount of work that went into creating this map has made me appreciate DCS World that much more. 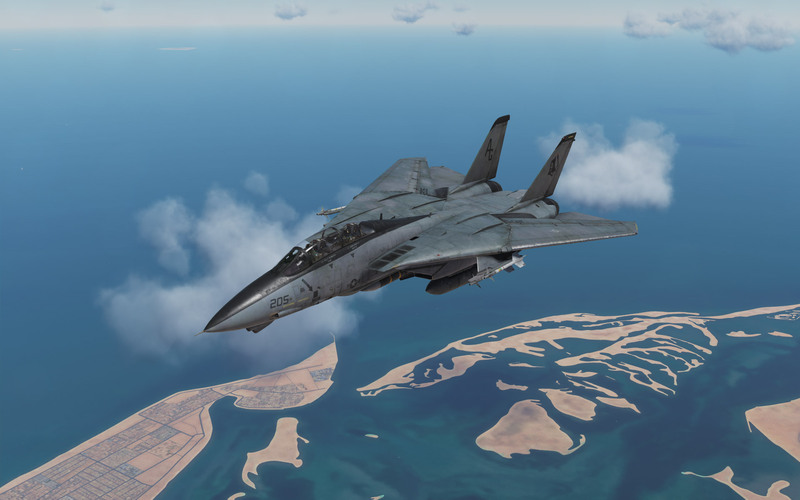 If you want to be ready for the future F-14 Persian Gulf based campaign, the planned F/A-18C campaign announced by Baltic Dragon, or you want to fly on one of the servers online featuring the map, then this is a purchase that you might really want to make. Eagle Dynamics did their best to pack a lot of value in here and it shows. And yes, it would make life a lot easier if the multiplayer version of this was unrestricted but that’s a discussion for another day. Next Post Easter Sale: 50% off most DCS World modules! The answer is clear. Yes, it is worth. Possibly because of the time spent (since Flanker 2.5) in the Caucasus, or just because so much of the recent stuff that inspires me to play in real life has taken place in a desert, I find myself going to the PG map more and more, above all others. It could be the weather outside too. I seem to fly more in the winter mountains of the Caucasus map when the season outside looks similar.